The women’s 200 breaststroke was the highlight swim of the night, though not because of it’s competitive for the victory. Rebecca Soni blasted the competition, as she so often does in this race, in a 2:21.46. That is the 2nd-fastest swim in the world this year, behind only her swim from the semifinals at the World Championships (though it’s faster than she was in finals of that meet). But as good as that swim was, Amanda Beard’s runner-up performance garnered perhaps even more buzz. She scored 2nd-place honors with a 2:24.46, owing partially to a great opening 100 split of 1:09.5. In both of the Olympic breaststroke distances, there’s big gaps between the top tiers of swimmers, but that swim by Bears was good for 9th in the world this year. That’s also only a tenth slower than she was at the 2010 Pan Pac Championships, when she earned her way onto the World Championship team. The question is how much faster Beard can get by the Olympic Trials. She can probably knock a few more tenths off, but realistically there’s a big chase on by the rest of the country to catch her. The leading candidates for that coming into the race were Andrea Kropp (2:27.27 – 6th) who will soon be training with Soni et al at USC, and Micah Lawrence (2:27.49 – 7th). But a new candidate has emerged in Louisville sophomore Gisselle Kohoyda. She had a breakout meet at the Tennessee Invitational a few weeks ago, and has continued to shine through this meet. She finished 5th (as the 3rd-ranked American) in this meet in 2:26.56. The top internationals were Yuliya Efimova, who seems to be on a bit of a different training schedule than her Trojan teammates, who was 4th in 2:25.12; and Canada’s Martha McCabe, who was 3rd in 2:25.08. Not to be outdone, Brendan Hansen posted his best swim since his comeback to win the men’s 200 breaststroke in 2:09.64. I guess it’s sort of an expected progression that his 100 would come back first (at Summer Nationals) and now his 200 is rising up to match it. That’s the 5th-best time of his career, bar-none, and by a second the fastest since he’s come out of retirement. That puts him 6th in the world this year, though unlike the 100 he’s still not the fastest American this year. That honor still belongs to Eric Shanteau, who was 2nd in this race in 2:11.28. The honor for 3rd-place went to SwimMAC’s Elliott Keefer in 2:12.40. That’s easily his best swim, in any event, since Pan Pacs in 2010. Kosuke Kitajima took 4th in 2:12.59. There were some great swims in the B-Final as well. Former UC-Davis All-American Scott Weltz won the heat in 2:12.37, which is by two seconds the best time in his career. 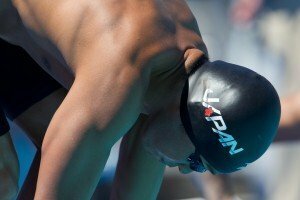 American men’s breaststrokes seem to be turning around a bit after a serious down cycle. Between the great times that we’ve seen here, along with Kevin Cordes’ great yards times at the Texas Invite, the trend is on the way back towards the top. The question then becomes whether or not they can get there in time for 2012. France’s Camille Muffat won her third long-freestyle event of the meet when she took the women’s 800 in 8:25.70. That’s her best time of the season, though by only .07. I sort of expected her to be a touch faster at this meet across her events (maybe an 8:24 here), but she still had a very good weekend of mid-season racing en route to the French Olympic Trials in March. Georgia/South African swimmer Wendy Trott also swam very well to take 2nd in 8:28.40. That’s her best time of the season. She’s been a force on the collegiate scene for the past three years, but she’s got another 8 or so seconds to be in contention for a medal at the Olympics (though, in distance freestyle events, getting close gives you a chance). Leah Smith, who is only 16, continued a breakout meet with a 3rd-place finish here in 8:34.74. That’s a 7-second drop for her, and a 13-second improvement in the race in 2011 overall. This drop is not a huge surprise, given that her USA Swimming record appears to only go back to 2010, but for her to be this fast at such a young age (with such a limited club-swimming history) is huge. In the men’s 1500, Sebastian Rouault took a win in a solid 15:12.22. There’s not a whole lot to say about this race, it was just a solid swim by Rouault. American Michael Klueh was 2nd in 15:19.32, followed by Georgia commit Matias Koski in 15:26.47. Koski’s swim was a 10-second career-best time. Missy Franklin again split her events between a gold and a silver on the final day of Winter Nationals. This 200 backstroke was the first of the races, and is probably her “best” if one had to be labeled as such, and she took a sizable victory in 2:07.14. Despite not being rested, she finished in a 31.78 final 50 split, which is better than she closed when she won the World Championship in July. The runner-up was Canada’s Sinead Russell, who is the young Canadian backstroke superstar, in 2:09.84. Liz Pelton, who started this meet incredibly well but slowed down a bit after a National Age Group record in the 200 IM, was 3rd in this race in 2:09.89. I think that most expected her to be faster than that, as she’s been faster this year even when she’s unrested. Shortly after the 200 back, Franklin followed-up with a 100 free runner-up in 54.86. This was an extremely tight race though, that could have gone any number of ways at the touch. It was Jessica Hardy who reached first for the wall with a win in 54.82. Dana Vollmer was 3rd in 54.88. 33-year old Erika Erndl swam her best time of the year to place 4th in 54.91. She seems to have gotten a serious shot in the arm since she made her first ever international squad this past summer, the Pan Am Games, and has been swimming extremely well at this meet – perhaps the best all-around meet of her career. She should make the battle for 400 free relay spots at the Olympics even more interesting. Kara Lynn Joyce took 5th in 55.24. 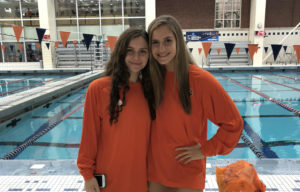 Whether or not that’s a good swim or not depends on what you’re comparing it to – she was faster at the April and May mid-season Grand Prix meets this summer, but this is a better time than she went at June’s Grand Prix meet. Given the sort of oddity of this meet, it’s hard to make a good comparison in sprint events that are coming down to tenths one way or the other. Tyler Clary swam very well to take home the 200 backstroke in 1:56.41. He was consistent throughout his lengths, with his final three legs all sitting at 29-mids. Jacob Pebley went the best time of his young career, and had his highest National Championship finish, when he took 2nd in 1:58.30. That put him just ahead of Tucson Ford’s Matt Grevers in 1:58.35. Pebley took that silver away from Grevers in a strong closing 50, which shows the differences in the two swimmers’ strengths. 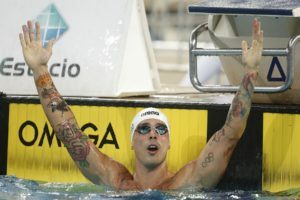 Indiana Hoosier/French swimmer Eric Ress was 5th in this final in 1:58.95. Nathan Adrian swept the sprint freestyle events with a 48.33 in the 100 free. That’s a great, and very encouraging, swim for him. Darian Townsend and Yannick Agnel tied for 2nd in 48.87. That’s the 4th-fastest time of Agnel’s career in an event that he’s really begun to excel at. Ricky Berens scored a 48.94 for 4th. Kathleen Hersey won the women’s 200 fly in 2:08.83, ahead of USC commit Jasmine Tosky in 2:09.74. That’s Tosky’s highest finish of the meet. Tyler Clary was 2nd in 1:57.03 in the 200 fly in a strong follow-up race. There’s been question about whether or not he should challenge for a spot in this event in London (I still think he should stick to the 400 IM and 200 back), but he continues to look good in the race. The winner was Sebastian Rousseau in 1:56.77. Louisville’s Pedro Oliveira took 3rd in 1:59.95. The Cardinals look more-and-more complete at every meet they swim. Alabama had the 4th-and-5th ranked swimmers with Anestis Arampatzis taking 4th in 2:00.04 and Alex Coci taking 5th in 2:01.16. The Crimson Tide men had a spectacular meet overall, and it’s hard to think of the last time where they’ve had two swimmers in the top 5 of any National Championship meet. They’re probably not ready to contend with Auburn for in-state supremacy, but isn’t it amazing that two programs this good can develop in a state that is a bit of a desert in the youth ranks. (Even moreso considering that Woody Joye, one of the state’s best recruits ever, left town to attend Texas. Ok, you have corrected me. 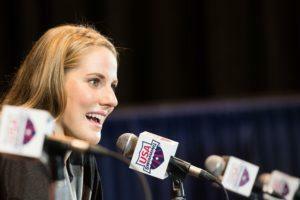 About Missy Franklin. Her last lenght in the 200m backstroke is great. Impressions about these Winter Nationals? I predicted they were little french championships. It has been the case in freestyle events. Best performance of the meet is for me Rebecca Soni, 2.21.46 in the 200m breaststroke, it’s great. Race of the meet is for me the women’s 200 IM. Regret of the meet is for me the absence of Katie Ledecky. With Camille Muffat as a target in the 400m free and in the 800m free I’m sure she would have broken some NAG records. She will be much stronger next year and some american swimmers are already afraid of her for the next olympic trials. Beauty of the meet is for me Olivia Smoliga, she’s a very beautiful girl.